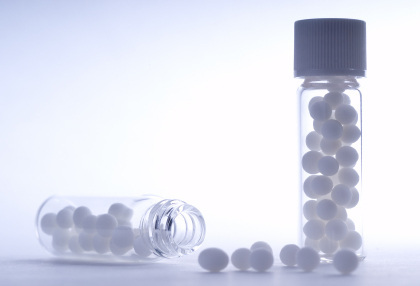 Homeopathy is a system of medicine which involves treating the individual with highly diluted substances, given mainly in tablet form, with the aim of triggering the body’s natural system of healing. Based on their specific symptoms, a homeopath will match the most appropriate medicine to each patient. Like with like Homeopathy is based on the principle that you can treat ‘like with like’, that is, a substance which causes symptoms when taken in large doses, can be used in small amounts to treat those same symptoms. For example, drinking too much coffee can cause sleeplessness and agitation, so according to this principle, when made into a homeopathic medicine, it could be used to treat people with these symptoms. This concept is sometimes used in conventional medicine, for example, the stimulant Ritalin is used to treat patients with ADHD, or small doses of allergens such as pollen are sometimes used to de-sensitise allergic patients. However, one major difference with homeopathic medicines is that substances are used in ultra high dilutions, which makes them non-toxic. The science Homeopathic medicines (which homeopaths call remedies) are prepared by specialist pharmacies using a careful process of dilution and succussion (a specific form of vigorous shaking). Its origins The principle of treating “like with like” dates back to Hippocrates (460-377BC) but in its current form, homeopathy has been widely used worldwide for more than 200 years. The Swiss government has recently released its research on the efficacy of homeopathic medicine. Read the article from the Huffington Post below.